PERFECT INVESTMENT OPPORTUNITY. Move in to this Amazing Full Brick, 1.5 Story home on HUGE LOT in desirable Montibello Crossing while making updates! This single-owner home has great bones and is ready for your personal touch. 4 BRs and 3.5 Baths. Over 3000 square feet. Kitchen has Granite Counters and updated wood cabinetry. 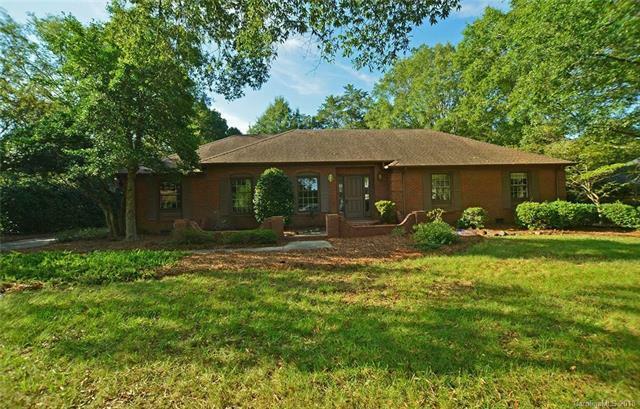 Large, Bright, Great Room has new carpeting and overlooks the Private, Wooded Backyard and Expansive Deck. Sizable Master Suite has 3 closets. Original Wood Floors in 2 bedrooms and Family Room off of the Kitchen Area. The Upper Floor has a 300 sq ft Teen / Guest Suite w/Full Bath accessed by Retro Spiral Staircase. Great Location just south of South Park. Only Minutes to Olde Town shopping center, Ballantyne & I-485 access! This home is Charming but needs your finishing touches! There is much to like with your own backyard retreat on .81 acres! Perfect for entertaining and outdoor living! Home being Sold As-Is. The price reflects the updates needed.